Fragments From Floyd was one of the first blogs I discovered when I went googleing on the phrase “Blue Ridge Mountains” (actually Marie Freeman’s “Blue Ridge blog” was the first site I hit and it was her links list I was following to Fred’s). 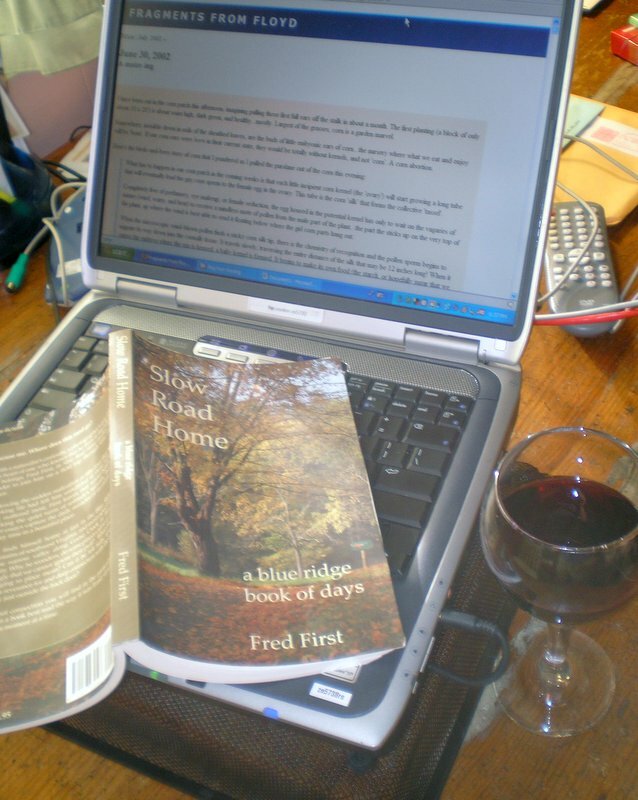 Fred’s writing spoke to me and when he starting blogging about the book project I was intrigued. When he made the pre-production order offer I jumped for it. As you can see from the photo, I have been having a time warping experience of it. Reading both the book and the “Fragments From Floyd” archives. Moving forward on one “slow road” as I move backwards on the other, makes for an interesting if warped sense of time and place. I highly recommend the book as a great read of the sort I haven’t read in years. And having the ability to follow the evolution of Fred’s style as he explored his muse in public on Fragments only adds to the enjoyment of the book. Next PostNext Why the National Guard?